Cook asparagus as directed on box for minimum cook time; drain. In 4-quart Dutch oven, heat butter and oil over medium-high heat. Stir in onion and leeks; cook 2 to 3 minutes. Stir in cooked asparagus; cook 1 minute. Stir in broth, salt, pepper, thyme and cumin. Heat to boiling. Reduce heat to medium-low. Cover and simmer 10 minutes. Uncover; remove from heat. Let stand to cool 15 minutes. In blender, place half of the soup and half of the yoghurt. Cover; blend on medium speed. Repeat with remaining soup and yoghurt. Place soup mixture in Dutch oven, and heat until hot. This soup can be eaten warm or cold. 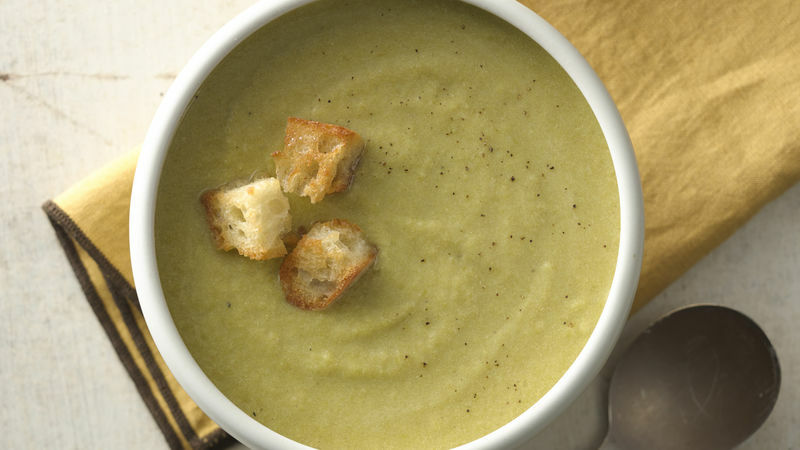 Serve this soup with croutons; it will add a nice texture and flavor. *Use any original plain yogurt. If using nonfat plain yogurt, decrease thyme to 1/4 teaspoon. This fabulous soup made with asparagus and yogurt will bring delight to the table.